AdBlock or Ghostery are two well-known ad blocking software’s installed on many computers. They affect millions of web publishers and literally become a nightmare for those dependent on Google AdSense to pay their bills. It takes a lot of time and effort to maintain a website and if users block ads, the revenue of the website will be diminished. A smart option to handle this problem would be to display alternative content to users who block ads. This can either be displaying a Facebook Like box, a Twitter widget, or even a custom message with an image in the place of the ad. One of those can be seen below. Whoa! Now you can start counting your revenue. 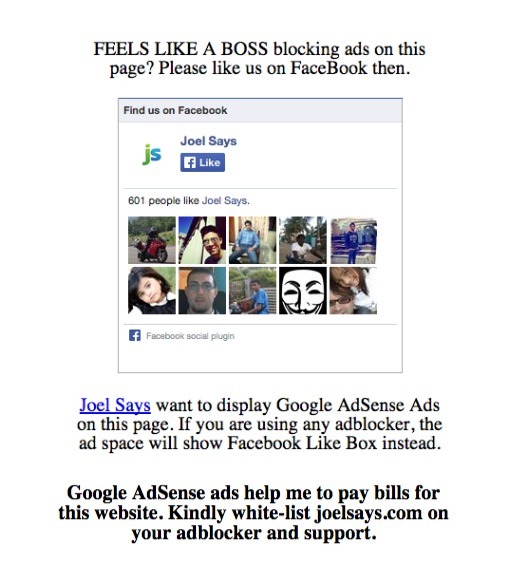 This entry was posted in advertising, media and tagged ad blocker, Adblock, Adsense, Ghostery, handle ad blocker user. Bookmark the permalink. This is good advice. Thanks !